This BRIEFing NOTE summarizes Child care by default or design? 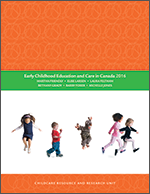 An exploration of differences between non-profit and for-profit Canadian child care centres using the You Bet I Care! data sets (Occasional paper 18). The issue of auspice in child care has been debated in Canada for many years and for several reasons. One reason for this is the consistent research finding that commercial child care centres as a group obtain lower ratings for overall program quality than do non-profit centres. Other reasons include the belief that essential services such as child care should be publicly operated, and concerns about ensuring accountability for the use of public funds if they are flowed to commercial operators. This study explores the issue of auspice from the perspective of program quality. Using the You Bet I Care! data sets, this study finds that the lower level of quality found in the commercial sector as a whole is not simply a reflection of the non-profit sector's greater access to resources but is related to between-sector differences in organizational structures, behaviours and characteristics. The findings reinforce and amplify previous research that has consistently suggested that child care services operated for-profit are less than likely to deliver the high quality care environments in which young children will thrive. This very much fits with the idea that a market model for child care is less than adequate for giving children the best start in life.